Please refer to our stock # 5433 when inquiring. Large, 18k yellow gold, natural ruby and sapphire statement bracelet. It measures 7 7/8" long x 7/8" wide. This amazing bracelet consists of approx. 1,2ctw of rubies and 0.95ctw of sapphires. It is in excellent pre-owned condition. Weight is substantial 72.21 grams of solid 18k gold. 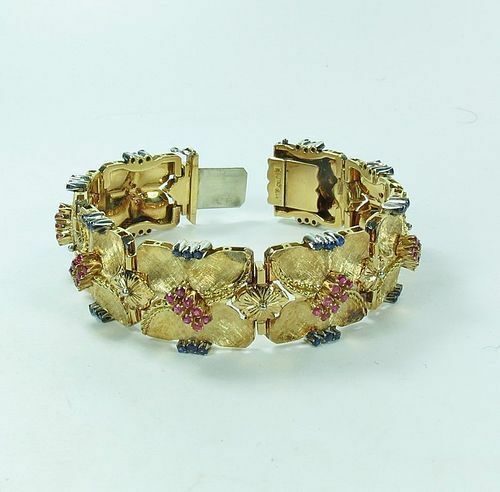 This circa 1950's bracelet is hallmarked 18k Italy. Each of the 8 segments is 7/8" long, one link could be easy removed by jeweler to create smaller size bracelet.